It comes down to who you are when you're at home. Hi, all. Noel Murray is at Sundance, Butch Cassidy and Sundancing his way through the festivities with Nathan Rabin, so I'll be covering Fringe tonight. Noel will be back soon, don't worry, but I'd be lying if I said I wasn't excited to get a chance to talk about what has become one of my favorite shows. I enjoyed Fringe's first season, for all its clumsiness; even at its worst, John Noble was always entertaining, and there were few other places on TV where I could get my required weekly hit of crazy science fiction concepts. But I stopped watching early in the second season. It's not that the show became markedly worse. I just had too many things I needed to make space for on the DVR, and once you miss a few episodes, it becomes exponentially easier to let the rest slide by. I'll catch up eventually, I told myself, and I did. But it took me awhile. I mention this because I had a blast mainlining all two-and-a-half seasons of Fringe in the past month, and for anyone who's still on the fence about the show, I can tell them unequivocally it was worth the effort. I also mention this because it still impresses me just how far how far this series has come since I took my hiatus. When I left, it was a decent show that vacillated between good episodes and clunkers, but while I always knew it had the potential to be more consistent, I never realized it had the potential to be great. I don't know if you could rank this on the same level as, say, Breaking Bad, and I don't really care; the comparison wouldn't really do much for either. But I do know that Fringe has become essential viewing for fans of genre television and that it's managing the sort of breakneck, emotionally engaged storytelling that's really all I ask for in the shows I love. I am continually amazed at the sheer chutzpah of the concepts here. Fringe deals in alternate realities, time travel, cyborgs, monsters, prophecies, and milkshake recipes, and since it started firing on all cylinders (basically since the second season episode "Peter," although there were strong episodes before that), all of these concepts feel well-earned and easy to relate to. Despite the complicated backstory, this is a show that always feels accessible. Olivia, Peter, Walter, and Astrid never seem so lost in the wild that we can't find them easily and yearn for their safe return home. That's really what it comes down to, for me: As bizarre as their circumstances become, our heroes are grounded, and their response to crisis is real. Plus, their goals are so clearly defined they might as well be wearing T-shirts with personal mottos printed on them. (Walter: "Don't Take Away My Son," Olivia: "Save The World," Peter… well, that's the question, isn't it?) That's where shows like this always seem to fumble. It doesn't matter how strange events become; the leads need clearly recognizable objectives, and we need to understand how those objectives can be realized. Admittedly, Walter's desperate need to protect Peter is more preventative than objective-oriented, but it's still easy to grasp. His son is everything to him, and given how their situation has developed and the role Peter will most likely play in the upcoming realidad a realidad, we know that Peter's safety is in danger. Sooner than any of us would like, really. That's what "The Firefly" is about (and I bet you thought I'd forgotten). It's Fringe's first new episode in its Friday time slot. There's no real freak here, but we do get to meet guest star Christopher Lloyd in the cold open. Lloyd plays Roscoe Joyce, ex-keyboardist of Walter's favorite band Violet Sedan Chair. Joyce gets a visit late one night at the mental institution (or is it a nursing home?) where he lives: It's his son, Bobby, who's been dead these past 25 years. The security cameras catch footage of their encounter, even though Joyce can't remember what his dead son told him, and the cameras also catch Bobby standing outside with our Observer friend. While "meeting dead people" is probably not that high up on the Fringe Division watchlist (especially when there's no body count), the presence of the Observer gets Broyles' attention, and he brings in the team. Which, it turns out, was the Observer's plan all along. Really, it's the plotting that kills me here, the elegance of it. Now, obviously, if the Observer is directly involved, there's going to be some Rube Goldberg stuff going down. But the reveal that Joyce's son died because Walter pulled Peter into our universe? That is just beautiful, beautiful writing. Fringe does procedural on occasion, and it's not unheard of for a procedural to introduce a guest star that has some special connection with one of the heroes. It's irritatingly coincidental, but we overlook it because it's also kind of neat. That the Observer would contact Joyce didn't immediately lead me to assume that Joyce had any relation to Walter beyond Walter's fanboy enthusiasm. As Joyce talked more about the loss of his son, I started to wonder if the Observer wasn't trying to provide someone for Walter to bond with over the potential loss of Peter. I didn't immediately connect the Observer's firefly speech (which is really just a variant on the old "For want of a nail…" saw, but still very effective) to Joyce's dead son, because I wasn't expecting there to be more to the mystery. I was wrong. In saving Peter, Walter inadvertently caused the car accident that killed Bobby. When it comes to stories, there are few things more gratifying than realizing the story you thought were being told wasn't the real story at all. It goes all the way to the ending, too. This whole, elaborate dance is put in motion by the Observer to, we're led to believe, help Walter let go of his son once and for all. At the climax of the episode, Walter thinks he's put together the pieces, and he makes the choice he believes will get Peter killed. It doesn't; the Observer just shoots him with his magic gun and disappears. But even before that point, I've decided I'm terribly clever, because I've found a hole: Why would the Observer bother warning Walter in the first place? If Walter hadn't known "Give me the keys and save the girl" was an important phrase, he would have done as Peter asked without thinking. Because Walter was expecting that moment and because he thought he knew what it meant, the Observer's plan nearly fell apart. It made sense dramatically, sure, but I thought the episode was fudging the logic to get that drama. I wouldn't have been bothered by that (I decided I was giving the episode an A after the Joyce reveal, unless, I dunno, Astrid died in the last fifteen minutes), but again, I was wrong. This was an experiment, and the point of the experiment wasn't to shoot Peter or to get him to drink the tainted milk or to give Walter a chance to hang out with one of his idols. The point of the experiment was to find out if Walter was willing to sacrifice Peter for the greater good. The important part was that Walter gave him the keys. It comes down to who you are when you're at home. Fringe is a show about a great number of things, but what sticks with me is the question of identity and the context we use to define ourselves. There are shape-changers, doppelgangers, whole universes full of other yous who turned left when you turned right, who looked up instead of smiling, who got on the next bus. In a sea of similar faces, how we are who we are comes down to what we care about and who we keep close to us and what we do when those we love are in danger. Walternate has clearly made his decision. He's intent on destroying another world and killing the son he lost, not because he necessarily has to, but because he refuses to imagine there might be another way. Our Walter, though, recognizes the consequences of his actions. Peter means the world to him, but "Firefly" proves that he's not willing to give up the world just to save Peter again. That gives me hope for Walter and for Peter and for Earth-1 and Earth-2. If there are possible futures, but no definite ones, who better to find the way to the right one but the one man who knows with awful accuracy the cost of taking the easy way out. I didn't get to talk about Anna Torv that much, as this episode wasn't really about her, but her chats with Peter about If You Meet The Buddha On The Road, Kill Him were heartbreaking. One of the best parts about watching the show from the beginning is seeing Torv turn Olivia from generic woman-on-a-mission into, as others have said, an absolute force of nature. Torv was never a bad actress, and while she's improved over the run, I think the biggest problem in the early going was that the writers really didn't do the character justice. That's definitely not the case anymore. So… If You Meet The Buddha, eh? Discuss. I heart Astrid. Yes, I love all the leads on this show, but Astrid should be Queen of All Things. I wondered briefly if drinking the dosed milk was going to make Peter super smart (which would make him more interested in the killer machine, I guess). Kind of grateful that isn't the case, as it wouldn't have made much sense. 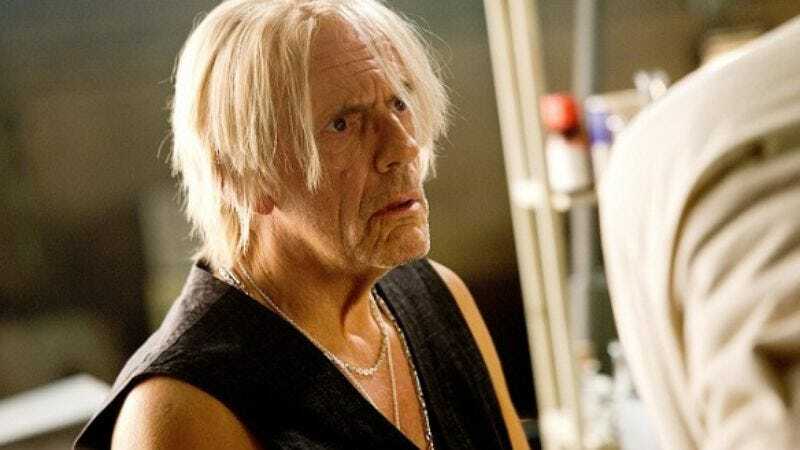 Christopher Lloyd was terrific, just very understated and sad. Fringe has already made a Back To The Future joke before (which is fitting, since Walter took Peter in 1985), so I guess Lloyd's presence here almost counts as a running gag.